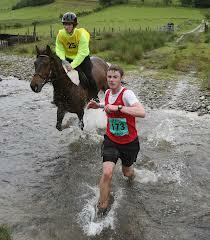 The Annual 22-mile Horse vs. Man marathon in Wales. This is my third entry in my series on Sports in the Bible, and it is time for a more obscure sport. Like many other things in the United Kingdom, it began as the result of a pub wager, but Man vs Horse racing is now an annual event in Wales. The 22 mile race is shorter than the typical “Marathon” but over much more difficult terrain. There are riders and runners. There used to be cyclists, but they have been banned.2 times has a runner crossed the line first 2004 and 2007. With all that in mind, the story of Elijah outrunning King Ahab’s chariot is incredible. Here is the lead up to this incredible race. It can be found at the end of 1 Kings 18. This story is the end of a great chapter. We have Elijah, standing alone against the prophets and worshipers of Baal. The Israelites are there, but they have wavered in their faith to God and have followed the lead of their king, worshipping Baal. Elijah suggests a showdown between Baal and Yahweh. The bulls are slaughtered, the altars are built and the Baalians get to go first. They begin worshiping and calling out to Baal. Predictably, nothing happens. Elijah begins taunting them “Where is your god? is he traveling? sleeping? relieving himself?” They cry out louder, they cut themselves, they rant and rave for hours. Baal is a no show. God reminds his people that He is the one true God. That is the most important point to this story. The God of Elijah, the God of Israel, the God that loves us still today is REAL. He is true, and he is powerful. Rejoice and celebrate this fact with me! But the story doesn’t end there. Elijah, climbs to the top of Mount Carmel to pray. His assistant is sent up to the summit 7 times to look out over the water. Finally, a small cloud appears – the size of a man’s hand. Elijah has his assistant go and tell Ahab to fire up the Chariots and head to town, or he will get caught in the rain that is coming. Ahab starts out toward Jezreel riding his chariot, Elijah, then overcome with the Power of the Lord, hikes up his robe and races the chariot to Jezreel. How cool is that. As if Ahab didn’t believe that fire from heaven was enough, now he is eating the dust kicked up by the heels of a man who is outrunning his chariot. It may be time for him to reconsider which God is all powerful and where he should place his trust. How does it make you feel to know that the One true God that used Elijah is looking to use you to show His mighty power? Are you ready to stand alone like Elijah did and proclaim your God as the One true God?